Learning how to make Beet Pickled Eggs is fun and easy! And once you have them on hand, they’re a great snack and are a fantastic way to enhance and brighten salads and other dishes. An Easter recipe, a cool art project, a beautiful work of art, and an incredibly delicious snack — that’s exactly what Beet Pickled Eggs are. After using all my pickled beets in the Kale Sprout Salad last week, I reserved the beet brine, knowing I wanted to use it for something. I had no idea what, though. As I was hard boiling eggs the next day and a little light went off in my head, and I decided to learn how to make Beet Pickled Eggs. First you must make Pickled Beets — also an easy and delicious project. Here’s how. to the brine and let them hang out there, in the refrigerator for three days. The result will be simply gorgeous, magenta eggs. You won’t believe how beautiful they are when you slice them in half! And when you taste them . . . oh my! Delicious! I say, get started on pickling your beets and eat them in salads for a couple days, — then do what I did, and create this awesome, delicious, beautiful work of art! And wow your friends and family with them this weekend. 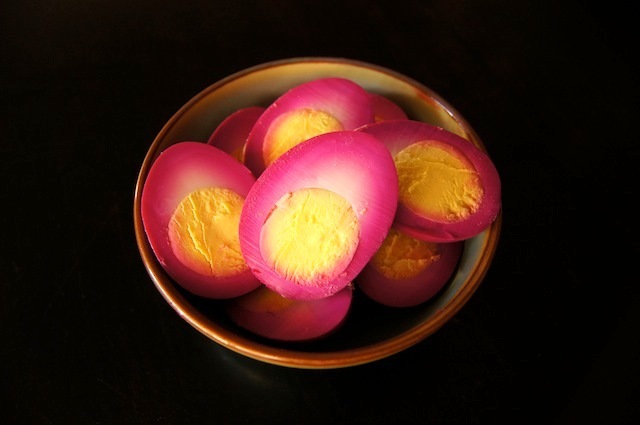 I hope you try it and love how easy it is to make beet pickled eggs! Learning how to make Beet Pickled Eggs is fun and easy! And once you have them on hand, they're a great snack and are a fantastic way to enhance and brighten salads and other dishes. Please note that almost all of the prep time is non active, marinating time. 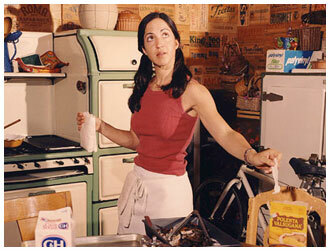 Add both vinegars, water, salt and sugar to a small saucepan. Bring to a boil and remove from the heat. Stir to be sure the salt and sugar are completely dissolved. Place the prepared beets and shallots in a large jar or glass bowl, and pour the vinegar mixture over them. Do not cover and let this cool to room temperature. Then cover with the lid or seal tightly with plastic wrap. Place in the refrigerator for at least two days before trying them. Remove the beets and shallots from the liquid. They are now delicious and ready to eat or be used in salads or other recipes. Do not throw out the liquid in the jar! Add the hard boiled eggs to the liquid. If the liquid doesn't come to the top of the eggs, add a bit more a bit more red wine vinegar and water so that it does. You may also need a bigger jar or container. Cover tightly, and let this marinate in the refrigerator for 3 days. Please note that the 5 minutes "active work time" does not include cooking the beets. Here's how to roast them. And while I love roasting my own beets, if you're pressed for time, you buy them already roasted, here. Just one word – gorgeous!!! Just two words – absolutely gorgeous! Plus I know how delicious beets and hard boiled eggs + cooked potatoes are in a salad with a creamy horseradish vinaigrette – great for Passover. Thank you, Nancy! Love creamy horseradish! Perfect. Pickled eggs…traditional Pennsylvania Dutch food! Here in the Pennsylvania Dutch Country we do that all the time. Yes they are very tasty. but this is how I’m going to try them for the first time. These are gorgeous. I love the photos. My Mother used to always make these! I’ll have to try these and surprise her! oooh, I must try it that way — a marbled egg is so beautiful. Thank you!